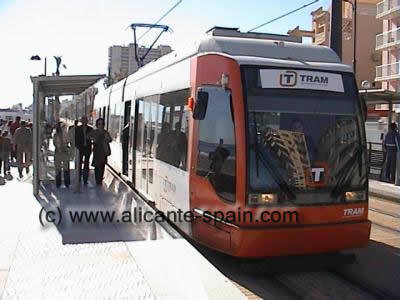 Alicante offers relatively good public transportation system. By “relatively good” I mean its a reasonably cheaply priced, but not always really well connected. Located in the harbor area of Alicante the Bus Station or Bus Terminal is the ideal starting point for all local, regional and international buses arriving and leaving Alicante. >> Click here for our detailed Overview on the Alicante Bus Station including a list of local bus companies. All about the Alicante airport bus, which brings you directly into downtown Alicante can be found on our Alicante Airport Bus page here. >> Click here to get specifics about timetables, the bus stop and bus lines from the airport in Alicante to the city of Alicante. The main railway station where all trains to major cities around Spain and internationally leave. Located in heart of Alicante. A long name for a very clever and cheap local area transport system. Gets you around several important areas in Alicante and connects to several important cities and towns along the northern Costa Blanca. Overview on all major taxi companies in Alicante and detailed locations of taxis stands. If you are arriving at Alicante airport we show you here, where to pick up a cab or taxi at the airport.